Whose Nukes to Worry About? Bradley is author of several bestsellers including Flyboys, Flags of Our Fathers and The China Mirage: The Hidden History of American Disaster in Asia. “Ho-hum, here we go again. 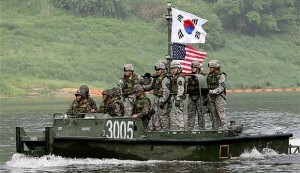 “Every year America pays its vassal-state South Korea huge sums of U.S. taxpayer money to mount 300,000-man-strong military ‘games’ that threaten North Korea. North Koreans view images that never seem to make it to U.S. kitchen tables: hundreds of millions of dollars’ worth of U.S. armaments swarming in from the sea, hundreds of tanks and thousands of troops — their turrets and rifles pointed north — and nuclear-capable U.S. warplanes screaming overhead. “But when a young dictator straight out of central casting responds to U.S. threats with an underground test on North Korea’s founding day, it’s the #1 story on the front page of the New York Times. “Let’s connect some dots. Washington and their note takers in the American press constantly tell us that crazies in Pyongyang and Tehran are nuclear threats. The misplaced, but easily sold, fears of the ‘North Korean missile threat’ and the ‘Iran missile threat’ allows the Pentagon to install ‘defensive’ missile systems in South Korea and the Ukraine which are actually offensive systems targeting Beijing and Moscow. “We need to look beyond the simplistic, race-based cartoon-like scaremongering to see that far more reality-based and frightening is the nuclear threat posed by the United States.